"Homage to thee, O Great God, Lord of Maāti,1 I have come to thee, O my Lord, that I may behold thy beneficence. I know thee, and I know thy name, and the names of the Forty-Two who live with thee in the Hall of Maāti, who keep ward over sinners, and feed upon their blood on the day of estimating characters before Un-Nefer2 ... Behold, I have come to thee, and I have brought maāt (i.e., truth, integrity) to thee. I have destroyed sin for thee. I have not sinned against men. I have not oppressed [my] kinsfolk. I have done no wrong in the place of truth. I have not known worthless folk. I have not wrought evil. I have not defrauded the oppressed one of his goods. I have not done the things that the gods abominate. I have not vilified a servant to his master. I have not caused pain. I have not let any man hunger. I have made no one to weep. I have not committed murder. I have not commanded any to commit murder for me. I have inflicted pain on no man. I have not defrauded the temples page 23 of their oblations. I have not purloined the cakes of the gods. I have not stolen the offerings to the spirits (i.e., the dead). I have not committed fornication. I have not polluted myself in the holy places of the god of my city. I have not diminished from the bushel. I did not take from or add to the acre-measure. I did not encroach on the fields [of others]. I have not added to the weights of the scales. I have not misread the pointer of the scales. I have not taken milk from the mouths of children. I have not driven cattle from their pastures. I have not snared the birds of the gods. I have not caught fish with fish of their kind. I have not stopped water [when it should flow]. I have not cut the dam of a canal. I have not extinguished a fire when it should burn. I have not altered the times of the chosen meat offerings. I have not turned away the cattle [intended for] offerings. I have not repulsed the god at his appearances. I am pure. I am pure. I am pure. I am pure...."
"O Usekh-nemmit, comer forth from Anu, I have not committed sin. "O Fenti, comer forth from Khemenu, I have not robbed. "O Neha-hāu, comer forth from Re-stau, I have not killed men. "O Neba, comer forth in retreating, I have not plundered the property of God. "O Set-qesu, comer forth from Hensu, I have not lied. "O Uammti, comer forth from Khebt, I have not defiled any man's wife. page 24"O Maa-anuf, comer forth from Per-Menu, I have not defiled myself. "O Tem-Sep, comer forth from Tetu, I have not cursed the king. "O Nefer-Tem, comer forth from Het-ka-Ptah, I have not acted deceitfully; I have not committed wickedness. "O Nekhen, comer forth from Heqāt, I have not turned a deaf ear to the words of the Law (or Truth)." The names of most of the Forty-Two gods are not ancient, but were invented by the priests probably about the same time as the names in the Book of Him that is in the Tuat and the Book of Gates, i.e., between the XIIth and the XVIIIth dynasties. Their artificial character is shown by their meanings. Thus Usekh-nemmit means "He of the long strides"; Fenti means "He of the Nose"; Neha-hāu means "Stinking-members"; Set-qesu means "Breaker of bones," etc. The early Egyptologists called the second part of the CXXVth Chapter the "Negative Confession," and it is generally known by this somewhat inexact title to this day. In the third part of the CXXVth Chapter comes the address which the deceased made to the gods after he had declared his innocence of the sins enumerated before the Forty-Two gods. He says: "Homage to you, O ye gods who dwell in your Hall of Maāti. I know you and I know your names. Let me not fall under your slaughtering knives. Bring not my wickedness to the notice of the god whose followers ye are. Let not the affair [of my judgment] come under your jurisdiction. Speak ye the Law (or truth) concerning me before Neb-er-tcher,3 for I performed the Law (or, truth) in Ta-mera (i.e., Egypt). I have not blasphemed the God. No affair of mine came under the notice of the king in his day. Homage to you, O ye who are in your Hall of Maāti, who have no lies in your bodies, who live on truth, who eat truth before Horus, the dweller in his disk, deliver ye me from Babai4 who liveth upon the entrails of the mighty ones on the day of the Great Reckoning (APT ĀAT, ). Behold me! I have come page 25to you without sin, without deceit (? ), without evil, without false testimony (?) I have not done an [evil] thing. I live upon truth and I feed upon truth. I have performed the behests of men, and the things that satisfy the gods.5 I have propitiated the God [by doing] His will. I have given bread to the hungry, water to the thirsty, raiment to the naked, and a boat to him that needed one. I have made holy offerings to the gods, and sepulchral offerings to the beautified dead. Be ye then my saviours, be ye my protectors, and make no accusation against me before the Great God. I am pure of mouth, and clean of hands; therefore it hath been said by those who saw me, 'Come in peace, come in peace.'" The deceased then addresses Osiris, and says, "Hail, thou who art exalted upon thy standard, thou Lord of the Atefu Crown, whose name is 'Lord of Winds,' save me from thy Messengers (or Assessors) with uncovered faces, who bring charges of evil and make shortcomings plain, because I have performed the Law (or Truth) for the Lord of the Law (or Truth). I have purified myself with washings in water, my back hath been cleansed with salt, and my inner parts are in the Pool of Truth. There is not a member of mine that lacketh truth." From the lines that follow the above in the Papyrus of Nu it seems as though the judgment of the deceased by the Forty-Two gods was preliminary to the final judgment of Osiris. At all events, after questioning him about the performance of certain ceremonies, they invited him to enter the Hall of Maāti, but when he was about to do so the porter, and the door-bolts, and the various parts of the door and its frame, and the floor, refused to permit him to enter until he had repeated their magical names. When he had pronounced these correctly the porter took him in and presented him to Maau (? )-Taui, who was Thoth himself. When asked by him why he had come the deceased answered, "I have come that report may be made of me." Then Thoth said, "What is thy condition?" And the deceased replied, "I am purified from evil things, I am free from the wickedness of those who lived in my days; I am not one of them." On this Thoth said, "Thou shalt be reported. [Tell me:] Who is he whose roof is fire, whose walls are living page 26 page 27serpents, and whose floor is a stream of water? Who is he?" The deceased having replied "Osiris," Thoth then led him forward to the god Osiris, who received him, and promised that subsistence should be provided for him from the Eye of Rā. The weighing of the heart of the Scribe Ani in the Great Scales in the Hall of Osiris. In great papyri of the Book of the Dead such as those of Nebseni, Nu, Ani, Hunefer, etc., the Last Judgment, or the "Great Reckoning," is made the most prominent scene in the whole work, and the vignette in which it is depicted is several feet long. 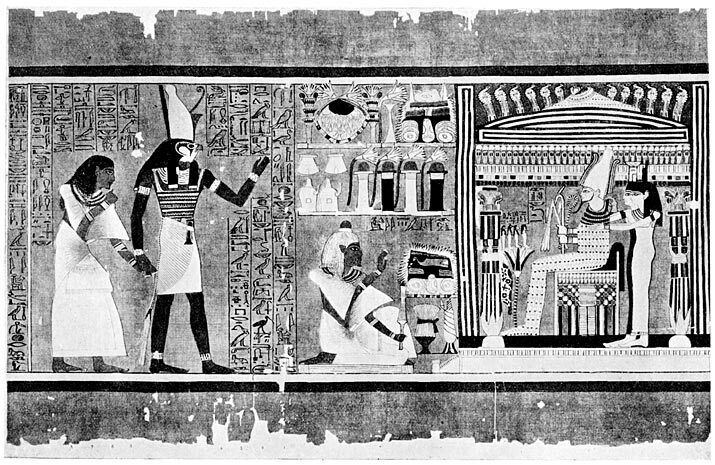 The most complete form of it is given in the Papyrus of Ani, and may be thus described: At one end of the Hall of Maāti Osiris is seated on a throne within a shrine made in the form of a funerary coffer; behind him stand Isis and Nephthys. 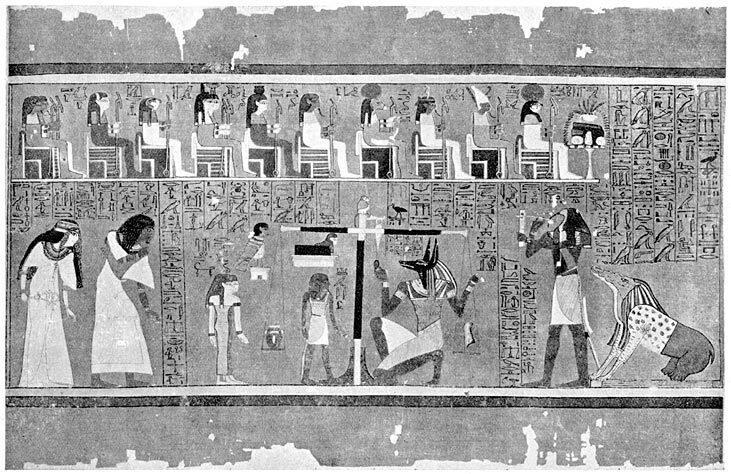 Along one side of the Hall are seated the gods Harmachis, Tem, Shu, Tefnut, Geb, Nut, Isis and Nephthys, Horus, Hathor, Hu and Saa, who are to serve as the divine jury; these formed the "Great Company of the Gods" of Anu (Heliopolis). By these stands the Great Balance, and on its pillar sits the dog-headed ape Astes, or Astenu, the associate of Thoth. The pointer of the Balance is in the charge of Anpu. Behind Anpu are Thoth the scribe of the gods, and the monster Āmemit, with the head of a crocodile, the forepaws and shoulders of a lion, and the hindquarters of a hippopotamus; the duty of the last-named was to eat up the hearts that were light in the balance. On the other side of the Balance Ani, accompanied by his wife, is seen standing with head bent low in adoration, and between him and the Balance stand the two goddesses who nurse and rear children, Meskhenet and Rennet, Ani's soul, in the form of a man-headed hawk, a portion of his body, and his luck Shai. Since the heart was considered to be the seat of all will, emotion, feeling, reason and intelligence, Ani's heart, , is seen in one pan of the Balance, and in the other is the feather, , symbolic of truth and righteousness. Whilst his heart was in the Balance Ani, repeating the words of Chapter XXXB* of the Book of the Dead, addressed it, saying, "My heart of my mother! My heart of my mother! My heart of my being! Make no stand against me when testifying, thrust me not back before the Tchatchaut (i.e., the overseers of Osiris), and make no failure in respect of me before the Master of the page 27 page 28Balance. Thou art my Ka, the dweller in my body, uniting (?) and strengthening my members. Thou shalt come forth to the happiness to which we advance. Make not my name to stink with the officers [of Osiris] who made men, utter no lie against me before the Great God, the Lord of Amentt." Horus, Son of Isis, introducing the Scribe Ani to Osiris. Then Thoth, the Judge of Truth, of the Great Company of the Gods who are in the presence of Osiris, saith to the gods, "Hearken ye to this word: In very truth the heart of Osiris hath been weighed, and his soul hath borne testimony concerning him; according to the Great Balance his case is truth (i.e., just). No wickedness hath been found in him. He did not filch offerings from the temples. He did not act crookedly, and he did not vilify folk when he was on earth." And the Great Company of the Gods say to Thoth, who dwelleth in Khemenu (Hermopolis): "This that cometh forth from thy mouth of truth is confirmed (?) The Osiris, the scribe Ani, true of voice, hath testified. He hath not sinned and [his name] doth not stink before us; Āmemit (i.e., the Eater of the Dead) shall not have the mastery over him. Let there be given unto him offerings of food and an appearance before Osiris, and an abiding homestead in the Field of Offerings as unto the Followers of Horus." Thus the gods have declared that Ani is "true of voice," as was Osiris, and they have called Ani "Osiris," because in his purity of word and deed he resembled that god. In all the copies of the Book of the Dead the deceased is always called "Osiris," and as it was always assumed that those for whom they were written would be found innocent when weighed in the Great Balance, the words "true of voice," which were equivalent in meaning to "innocent and acquitted," were always written after their names. It may be noted in passing that when Ani's heart was weighed against Truth, the beam of the Great Balance remained perfectly horizontal. This suggests that the gods did not expect the heart of the deceased to "kick the beam," but were quite satisfied if it exactly counterbalanced Truth. They demanded the fulfilment of the Law and nothing more, and were content to bestow immortality upon the man on whom Thoth's verdict was "he hath done no evil," . page 30In accordance with the command of the gods Ani passes from the Great Balance to the end of the Hall of Maāti where Osiris is seated, and as he approaches the god Horus, the son of Isis, takes him by the hand and leads him forward, and standing before his father Osiris says, "I have come to thee, Un-Nefer,6 I have brought to thee the Osiris Ani. His heart is righteous [and] hath come forth from the Balance. It hath no sin before any god or any goddess. Thoth hath set down his judgment in writing, and the Company of the Gods have declared on his behalf that [his] evidence is very true. Let there be given unto him of the bread and beer which appear before Osiris. Let him be like the Followers of Horus for ever!" Next we see Ani kneeling in adoration before Osiris, and he says, "Behold, I am in thy presence, O Lord of Amentt. There is no sin in my body. I have not uttered a lie knowingly. [I have] no duplicity (?) Grant that I may be like the favoured (or rewarded) ones who are in thy train." Under favour of Osiris Ani then became a sāhu, , or "spirit-body," and in this form passed into the Kingdom of Osiris. 1 I.e., Truth, or Law, in a double aspect. 2 A name of Osiris. 3 I.e., the "Lord to the uttermost limit of everything," or God. 4 , he was according to one legend the firstborn son of Osiris. 5 I.e., I have kept the Moral and Divine Law. 6 I.e., the "Beneficent Being," a title of Osiris.